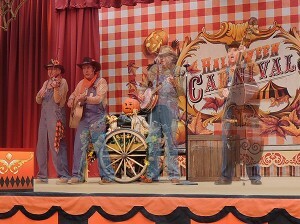 Here’s a neat addition to Halloweentime at Disneyland this year — a special “haunted” version of Billy Hill and the Hillbillies! 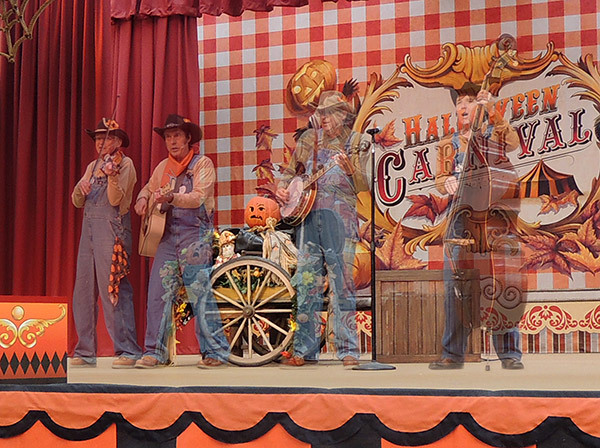 The “Ghost Billys” effect makes use of a very large-scale “Pepper’s ghost” effect (similar to the ballroom scene in the Haunted Mansion and, outside Disneyland, in Knott’s Berry Farm’s Mystery Lodge where clever reflections are used to make it appear that the show is playing to a large audience). The trick involves a gigantic angled pane of perfectly clear glass and requires the Billys to do the entire show lying on their backs in a pit below stage level. Off in the distance, behind the Royal Theater, it’s Rapunzel’s tower peeking over the top of the canopy! This is such a lovely bit of statuary that we immediately went to City Hall and requested that it be moved somewhere to make it more centrally visible, but even if Disney keeps it where it is it’s a delightful treat when discovered! The first annual Disneyland Jingle Cruise is coming! Skippers dressed in itchy hand-made sweaters. Jungle mist replaced by Christmist. Temple ruins covered in twinkly lights. Elephant squirts trunkfulls of eggnog at boat. Gorilla with gun collecting for the Salvation Army. All giraffes draped in tinsel. Over in a corner somewhere there’s a toucan with a dreidel. Bamboo forest painted with red and white stripes. Charging hippo chased away with traditional British Christmas cracker. Beautiful bows on all human skulls. Hungry piranha replaced by flailing, drowning elves. 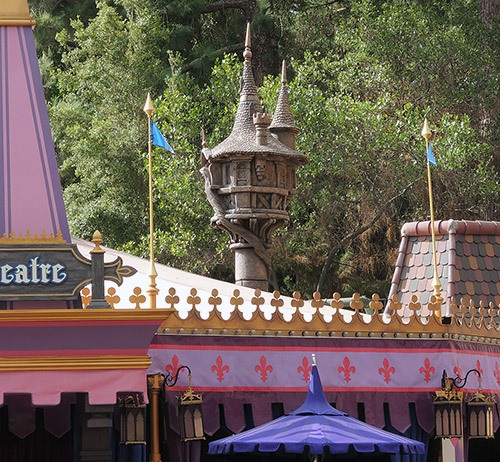 We at Disneylies are very much of the “Disneyland should never, ever change anything for any reason” camp, to the point that we’re still irritated that most of the castmembers we remember from our childhood are no longer working in the park. For this reason, we are particularly miffed about the recent conversion of Market House (comfy, friendly, free coffee refills) into a Starbucks (vocabulary-offending, inhumanly corporate, possibly a branch of the Illuminati). 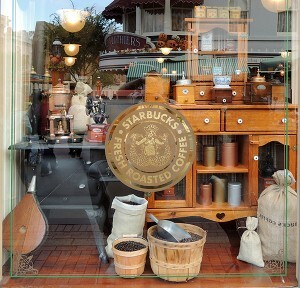 First and foremost, Starbucks just doesn’t mesh well with Disneyland’s theme. In fact, Starbuck himself isn’t even a Disney character (he’s owned by MCA/Universal, and changing him into a woman to try and capture the “princess” market does nothing to change that). Second and foremost, expanding the Market House destroyed much of its charm. Sure the checkerboard is still there, but nobody can play a decent game with their hands shaking after a triple espresso, and setting up the old iron stove to spit out steam and foam robbed it of much of its charm. Look at the enormous queue — parallel to the coffee queue — that was built just for the party line phone! The whole concept of a line for the party line phone line robs the experience of spontaneity, and the fact that they had it roped off when we visited (because no castmember was available to check that children met the new minimum-height requirement for listening to the phone) added insult to injury. 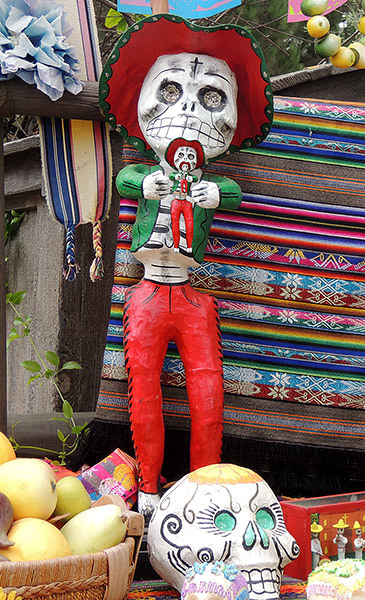 We always enjoy Disneyland’s annual Day of the Dead displays (and strongly wish they’d bring back that Ducktales of the Dead event they had some years back). This year’s display, featuring a traditional self-referential fractal skeleton, is particularly nice. Disney has announced that this year, because of it’s company-wide “healthy eating” initiative, all traditional sugar skulls sold in the Disneyland Resort will either be made out of organic honey (frozen solid so they maintain their shape until ready to eat), hand-carved cauliflower, or low-calorie Splenda. When the Disneyana shop was mercilessly vaporized for the sake of a populist caffeine purveyor, its facade was reworked into the semblance of a small-town antiquarian bookstore. 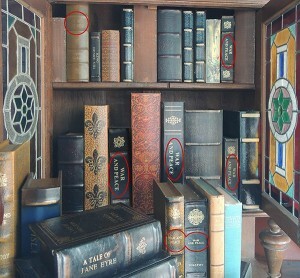 “The Book Rest” is a lovely addition to Main Street, U.S.A., but we have some questions regarding the choice of books on display in the store’s window. Let us say that again in italics with an exclamation point at the end: seventeen copies of War and Peace! Why this book? Is it the basis for an upcoming animated feature? Did they have a bunch of it lying around in their garage? Could it be some kind of veiled threat? If you have any idea why the Imagineers who decorated these windows were so obsessed with War and Peace, please let us know in the comments. When we were young, characters wandered the streets of Disneyland with the same happy, care-free abundance that rodents wandered the streets of London before it was learned that they spread the plague. True, the analogy suffers because we like Disneyland characters but dislike plague rats, but the point stands. 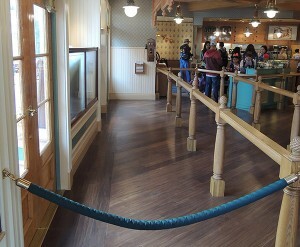 All of this changed when guests realized that characters would politely sign autographs for those who requested them. Today, characters are often mobbed to the point of inaccessibility by autograph seekers, and the line to wave a pen at Peter Pan might be an hour long (or half that if FASTPASS is available). 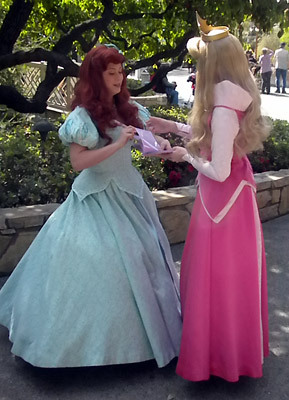 Yes, you can believe your eyes: Ariel is asking Aurora for her autograph. Why, you ask, would a princess need another princess’ autograph? Particularly a princess who lives beneath the ocean and therefore can’t take an autograph book home without it becoming instantly waterlogged? And if this bizarre perturbation of roles is allowed, what next? Guests performing safety inspections? Shops staffed entirely by feral cats? Disneyland executives actually seen in the park? The mind boggles. Please forward, Facebook, tweet, post, re-post, Instragram, Spotify, blog, pin, e-mail, link to, and share this photo as much as possible. We hope that, should it gain enough publicity, we will be able to get an official statement from Disney of their policy on character-to-character autographing interactions. 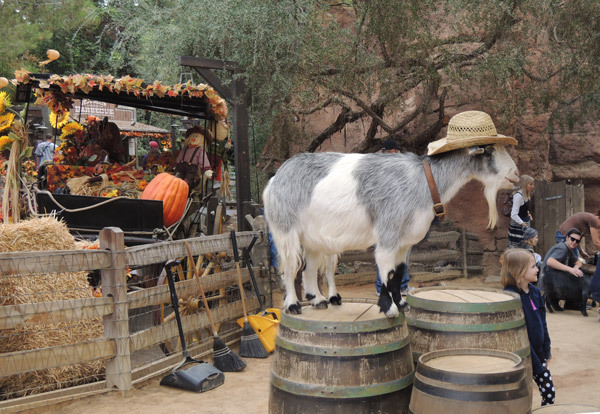 On our most recent trip to Disneyland, we noticed that the park was showcasing its famous “five-legged goat” for Halloween. Nice to see it back!